Next generation technology that helps you sell more and lose less. Selling your products is only half of the equation. Protecting your products against unwarranted returns and fraud is an equally important step that can help make or break your bottom line. Our state-of-the-art product tracking technology integrates with your point-of-sale to systematically track sales and validate returns according to your policy. With an overall prevented return rate of 11 percent, we help tranform returns into revenue. We provide our partners with industry-leading services that track the complete lifecycle of a product through a unique fingerprint rather than customer data. Our anonymous product tracking fuels our database and feeds real-time information, empowering you to make smart and timely decisions at the returns counter to enhance your customer experience. Our product tracking technology captures a product’s unique fingerprint through your point of sale and other channel touchpoints and records the transaction history to our secure database for simple and seamless lifecycle tracking. This information is stored for future queries and services. Our return validation service creates a smooth experience at the returns counter by validating return attempts systematically and on demand to reduce fraudulent, out-of-policy and cross-retailer returns. This service does not require a receipt, limits employee training and mitigates loss. Each of our enhanced services, which can be added to our core technology, fine tunes business operations and the customer experience, allowing retailers and manufacturers to further streamline their processes for tracking and returns management. With Product Tracking Logistics, shipping records are transmitted to our database to start tracking at their origin prior to distribution. Our Business Intelligence services supply users with a configurable dashboard that provides insight into product sales, consumer behavior and return patterns. Our Dynamic Transaction Data simply aligns and links daily sales and returns data for every product, at every store, at the serial number level, making interpreting the data easy. Our Call Brief services give call center agents real-time access to product records via a secure interface, allowing them to make customer calls more effective and profitable without requiring a proof of purchase. With our RTV Agent, retailers, manufacturers and their authorized return centers have a seamless solution for return-to-vender eligibility based on contractually maintained terms and conditions. Using our Promotion Focus service, you can determine the impact and success of each unique promotion by tracking them at the unique item level with greater precision. BLock (Bios Lock) uses software at the factory to digitally lock products at production and requires an activation code post sale. Our Record of Receipt service helps reduce shrink by enabling retailers to scan and record items into a detailed database of new inventory as they are received. Our Active Recovery Network is made up of participating retailers, manufacturers and more than 5,000 law enforcement agencies who collaborate to recover stolen property and help resolve cases. 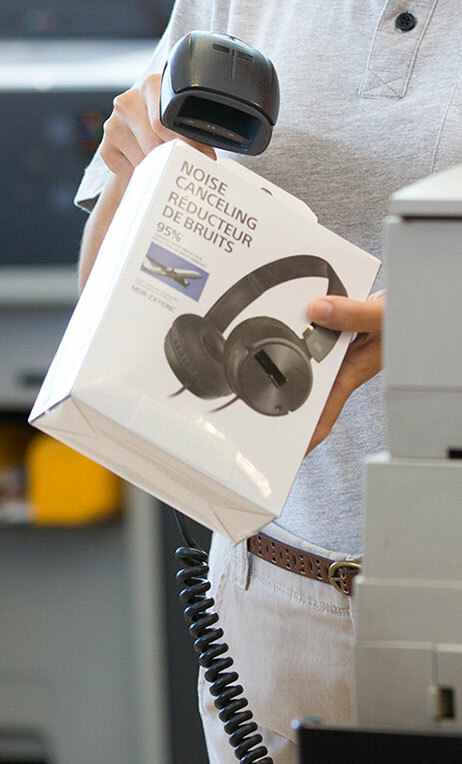 Using our product tracking and and return validation technology, a manufacturer of personal audio devices had a return on investment of nearly 1,700 percent and reduced counterfeit returns by 90 percent. Our product tracking technology can be applied to a variety of products, from vacuums to video games, baby monitors to car batteries, tablets to televisions. Your product insight is our priority, and with an average 8 to 1 average return on investment on boarded products under $75, it's hard to argue with success. Current partners can log in to their accounts by clicking here.